First concert i ever went to,only 14 at the time & still one of the best ever.Had dam good seats on left side of stage,first row up stairs,what a great view. Still remember some of the video's that was played behind the band as they played & also the green laser's & smoke half way frew Close To The Edge. Also still have the concert poster for the 6 nights they played at Wembley Arena. 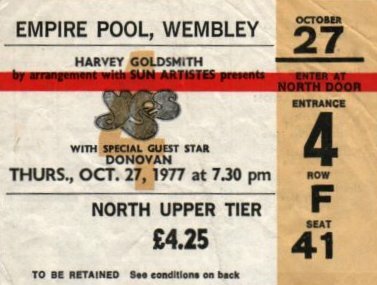 Happy days for �4.50 a ticket. I wasn't there -- but I have no record of Yes doing "Perpetual Change" on the 'Going For The One' tour. They did perform an excerpt of it as part of "The Big Medley" for the 'Tormato' tour and the riff was used as a brief intro on the 'Talk' tour -- but "Perpetual Change" was generally neglected by Yes in their set lists, until it got fully resurrected in 1999 for 'The Ladder' tour. No Perpetual Change at all I'm afraid. Does my memory serve me right that they did Perpetual Change as an encore at the concert I went to? That was after Rick Wakeman came on, tapped a note and the croud roared. Another note and another roar. Then repeated several times. Sad to say I went to every Wembley Yes gig on this tour. However on this particular Thursday my future wife was somewhere in the arena. It wasn't until the year 2001 when we were having a drink early in our relationship that we discovered this fact. Needless to say marriage was inevitable. We'd like to carry on with a song we wrote five years ago. It's called 'And You And I'.